If you are planning to set up a Twitter account for your class or you want to create an account to use it for professional development purposes then the step by step visual guide below is what you need. 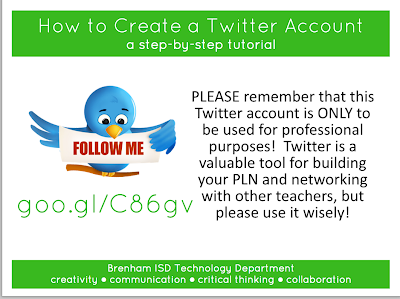 The guide is created by Brenham ISD technology department and will walk you through the different processes you will need to go through to finish your Twitter registration and get your profile up and going. You will also find at the last two slides of this guide a page featuring some popular Twitter terms explained so that you get familiar with the jargon used in Twitter and the last page provides some interesting reads about Twitter curated from different educational blogs.